﻿During the 1950's this company switched to making a wide range of hard plastic dolls, babies, toddlers and girls in various sizes. They were in competition with other British manufacturer doll makers such as Roddy, and Pedigree . 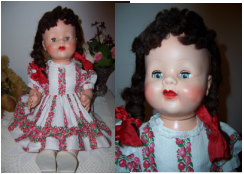 This very pretty doll is marked BND London on the back of her neck, and is wearing her original outfit. Her face looks quite similar to the Pedigree dolls and they were made at the same time.
. a full head of original brunette mohair which has the two plaited style with a fringe. .a pretty face with no hairlines.
. body has an even colour all over. BND dolls have a removable mama grille in the front of the body and her mama is silent. The original mama's are smaller in size compared to Pedigree dolls and to replace it you will need to buy a smaller voice box. She is wearing her original outfit. Her dress is made of a cotton fabric and BND dresses were never tagged. She has a cotton onesie on underneath which appears to be of the similar age as the dress. Her white shoes have"British National Dolls London" on them and vintage original socks. She is a gorgeous doll.